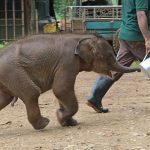 Elemotion Foundation has sponsored seven orphaned elephants at the Elephant Transit Home, located in Udawalawe National Park in southern Sri Lanka. 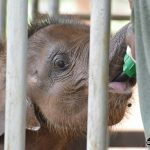 The Transit Home is the only orphanage in the world to successfully rescue, rehabilitate, and release orphaned Asian elephants back to the wild. Elemotion Foundation is in search of kind donors who will foster our babies through their rehabilitation period at the Transit Home. After rehabilitation, the orphans will be released back to the wild. 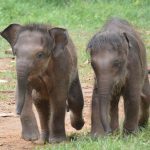 Elemotion Foundation currently has three released orphans now living free in national parks. If you’d like to become of foster parent, please follow this link to Foster an Orphan. Kaha-Kurulla is our youngest orphan. In January 2016, he was found trapped in an abandoned well. He was in good condition and estimated to be about 4 months old. After attempts to reunite him with his herd were unsuccessful, he was brought to the Transit Home. Kaha-Kurulla means ‘Yellow Bird’, a perfect name for such a bright and lively little calf. His best friend is Gemunu, and the two boys are constantly together, playing and getting into trouble. 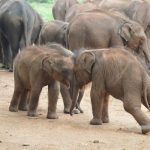 When they were less than a year old, Kaha-Kurulla and Gemunu were kept in a special group of youngsters called the baby herd where they received specialized care from the keepers. Now, they are part of the larger orphan herd growing strong and socializing. 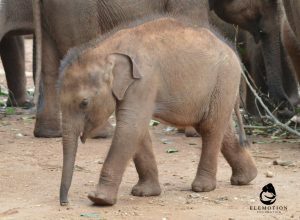 Want to see more of our adorable orphans? See all six of our previous orphans on our Released Orphans page. Or, visit our media page and watch our videos about Vibhishana, Elemotion’s first orphan.